While the US had provided the American M7 105mm HMC (“Priest”) to the Commonwealth forces, it was not popular due to the fact that 105mm was not a standard British caliber and they preferred the 25-pdr gun/howitzer as a standardized weapons system. So experiments were carried out to adopt the same concept and layout of the M7 Priest to use the 25 pounder on a Canadian Ram chassis (basically the same M3 chassis used for the M7). The new hull incorporated British design concepts (driver on the right, not the left) and fittings to include British radio sets and mountings for Bren light machine guns vice the “pulpit” for the M2 .50 caliber which had given the Priest its nickname. Keeping in the same line (showing a good sense of humor!) the new gun was nicknamed the Sexton. Production began at the Montreal Locomotive Works (Canadian branch of the famous ALCO works, who built medium tanks in the US) in late 1943 and provided some 2,150 self-propelled guns to the Commonwealth forces. Easy to service and maintain, they remained in service into the 1960s with some Commonwealth forces. The “BUT” comes in as it is a perfect match to the vehicle currently residing on the floor at “Firepower”, the Royal Artillery Museum at Woolwich, England. I took a number of photos of that vehicle and all of the details captured by my camera are present here in the kit, such as the “cage” in front of the radio set to prevent damage and the loading port in the left side of the hull. But this is most likely a vehicle which remained in service well into the late 1950s or even 1960s with the Territorial Forces (e.g. reserves) and as such I do not have a way to determine how much was changed from WWII. It has all of the hallmarks of a very late production vehicle – “upswept” trailing bogies with “spoked” welded road wheels, “solid” drivers, welded idlers, a three-piece transmission cover with guards for the lights, cargo rails on either side of the engine deck, and the British pattern of steel cleat tracks. 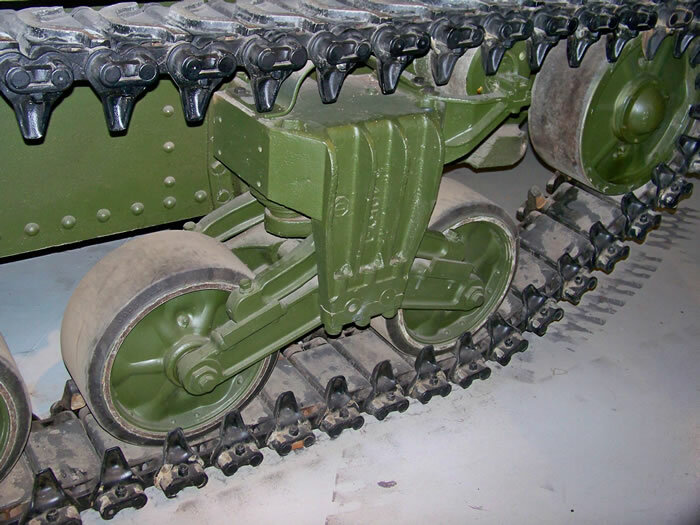 Earlier versions of the vehicle apparently had M3 style (top mounted return roller) bogies and either WE210 rubber or CMP cast tracks, no rear stowage bins, and other detail differences. Also, there are no Bren guns provided for the hull even though the mount bases are present. The model uses the hull from a DML M4 early production version with binning molded onto the floor. The kit also comes with the large sprues for the M4 generic suspension with different styles of wheels and “flat” bogies plus the add-on sprues for the “spoked” wheels and “upswept” bogies. As noted the tracks are DS Plastic one-piece runs; unlike the helpful hints in their 1/72 scale kits DML does not tell you how long they have to be to give a tight but correct fit, so the modeler will have to trial and error (these usually run a bit long and have to be shortened, but as the plastic can be cemented together with styrene cement it usually is not difficult to fix). The basic parts for the 25-pounder come on one sprue from the Mark II kit and on one of the Sexton sprues, and while all styrene they look quite serviceable. The interior parts are fairly complete, but the ammunition lockers in the right rear section of the open hull come closed so “in action” posing will take some scratchbuilding or after-market bits. A considerable amount of detailing is provided for the engine deck, such as all of the pioneer tools (more than on a regular tank), cable reels, stowage boxes, and etched brass strapping and engine air intake. This is over a very shallow spot on the engine deck, and some modelers may wish to open it up to provide greater depth. Design credit goes to Hirohisa Takada, but I know several others also participated in the research and design work on this kit. Five finishing options are provided: 147th (Essex Yeomanry) Field Regiment, RHA, Normandy 1944 (black over olive, stars, F3-45, S233972, “FEE”); 4th Field Regiment, RHA, 4th Armoured Brigade, Weert, 1944 (black over olive, stars, S234006, “Via Simba”); Unidentified Unit, Northwest Europe 1944 (black over olive, stars, S233964, F4-45); 13th Regiment, RHA (HAC), Northwest Europe 1944 (olive, stars, 76, no census number, “HANNIBAL III”); Unidentified Unit, Northwest Europe 1945 (olive, small stars, S233861, no markings). All have their census numbers provided via a “number jungle” on a small sheet of Cartograf decals. There have been some comments on the Internet about the markings but all were researched by Ron Volstad during the painting of the box art; associations may not be corrected based on who noted them in original materials. Overall this is an excellent model and one with a long period of usefulness and application, and with some tweaking and apropos figures can be used until fairly recent times. 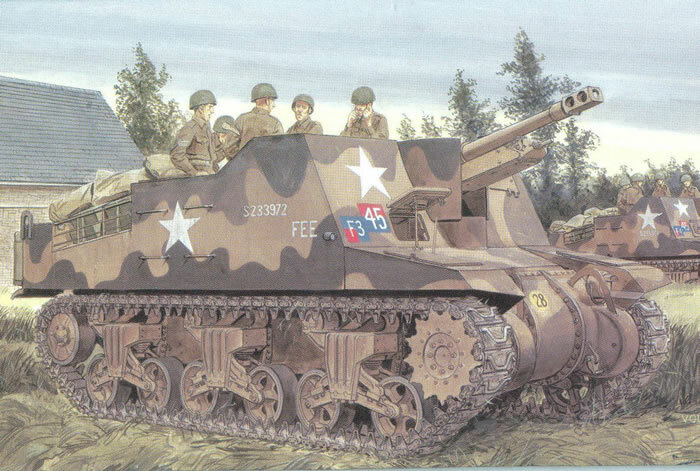 One item I missed on the review is that the Sexton II used the reinforced bogie carriers developed in Canada for the Ram and not standard Sherman type bogies. The kit does not provide them. They can be obtained either after market or the more adventurous modeler can modify the kit ones to match. Attached is a photo of one of these bogies on the Sexton II at Firepower. Also the short-pitched cast single pin tracks are CDP type, not CMP.